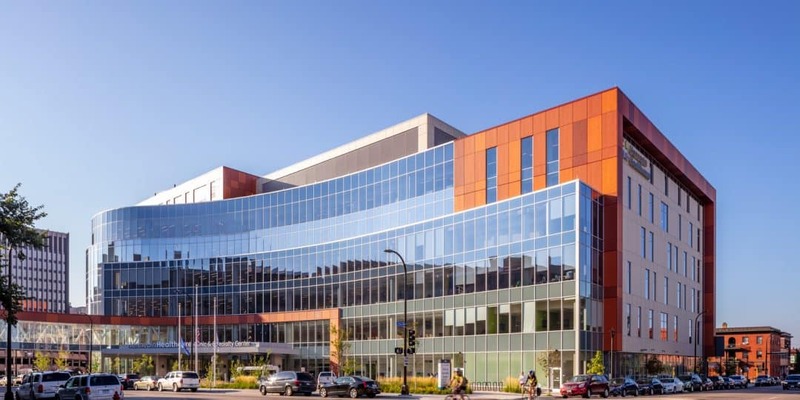 The 384,000-square-foot Hennepin Healthcare Clinic and Specialty Center received LEED® Gold certification, a major achievement for an ambulatory care facility of its size. The health care center opened in spring 2018 to wide acclaim for its attention to its urban location and neighborhood surroundings, both contributors to the certification. The site is a brownfield redevelopment that incorporated the residential neighbors to the south in both design and amenities, including open space and a pocket park that exceeded city requirements as well as underground parking and stormwater retention system to improve land use, reduce run-off, and avoid surface parking. Plant selections and more efficient irrigation methods around the facility reduce water use by more than 50 percent compared to traditional landscaped sites. Inside, the use of low VOC materials and a building flush-out before occupancy helped create a healthy indoor environment. Walk-off mats at entrances control contaminants entering the facility, and Hennepin Healthcare also incorporated policies to minimize waste and optimize pest management. In addition to its healthy design elements, energy efficiency strategies for the ambulatory center reduced the estimated energy use by more than 21 percent compared to a LEED® baseline building. Hennepin Healthcare’s Clinic and Specialty Center consolidated 26 primary and specialty clinics spread across nine building into the six-story facility. It houses primary and specialty care clinics, a dental clinic with 26 operatories, physical and occupational therapy programs, and a same day surgery center with seven operating rooms and four GI/endoscopy rooms. The clinic is also home to a comprehensive cancer center with radiation therapy, an outpatient imaging center, women’s imaging, and skyway and tunnel connections to the rest of the campus. Marking the biggest expansion in the history of Minneapolis/Saint Paul’s largest teaching hospital – Hennepin County Medical Center – the Clinic and Specialty Center is the first phase of a master campus plan that reorganizes the care it offers to make it more accessible and centralized for the thousands of patients it serves from across the region.